Cao, D., Bai, Y. and Li, L. (2018). Common Carotid Arteries Occlusion Surgery in Adult Rats as a Model of Chronic Cerebral Hypoperfusion. Bio-protocol 8(2): e2704. DOI: 10.21769/BioProtoc.2704. Chronic cerebral hypoperfusion (CCH) is an important risk factor of vascular dementia (VaD) and Alzheimer’s disease (AD). Hypoxia/ischemia in the whole brain induced by CCH causes serious damage to brain structure and function, which can lead to cognitive impairment. Two-vessel occlusion (2-VO), also known as permanent, bilateral common carotid artery occlusion, is one of the most widely used animal models (e.g., rat) of CCH to investigate the mechanisms of neurodegenerative processes. 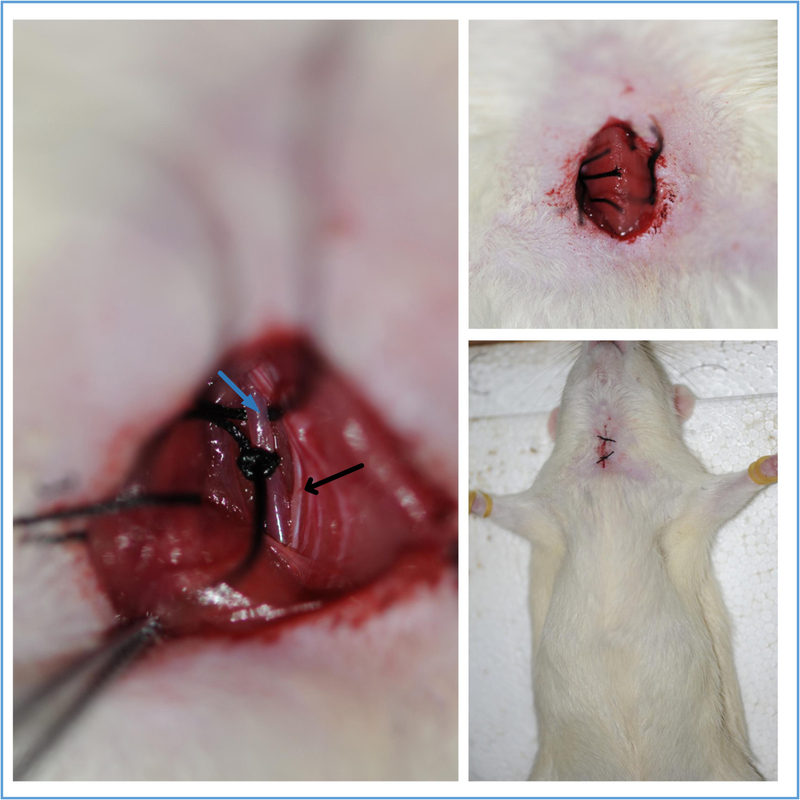 In this protocol, we present the surgical procedure for 2-VO in rats. Many neurological and psychiatric illnesses are caused by disorders of the cerebral circulation. A sudden interruption of the blood supply to distinct brain regions can lead to stroke, while a gradual reduction of continuous cerebral blood flow (CBF) impairs memory processes and contributes to the development of dementia (Farkas and Luiten, 2001; Matsuda, 2001; de la Torre, 2002). In the 2-VO rat model, there is a dramatic decrease in CBF to the brain during the acute ischemic phase (2-3 days post-operation) and the cortical and white matter areas have the largest decrease in blood flow, reaching 35%-45% of the control level (Otori et al., 2003). In the chronic ischemic phase (1-3 months post-operation), the CBF values begin to gradually recover at 1 week, but are still significantly lower than the control values 4 weeks after 2-VO induction (Schmidt-Kastner et al., 2001; Otori et al., 2003; Tomimoto et al., 2003). After 8 weeks to 3 months of 2-VO, only a slight reduction or virtually no reduction of flow has been reported (Otori et al., 2003). Finally, after 6 months of 2-VO, the CBF almost returns completely to normal (Choy et al., 2006), because other arterial sources of blood provide compensatory blood flow (via the circle of Willis, Figure 1) to areas that typically are supplied by the common carotid (Farkas et al., 2007). The 2-VO model exhibits characteristic features of human CCH condition, such as cerebral blood flow and metabolic changes (Ohta et al., 1997; Otori et al., 2003), learning and memory disturbances (Farkas and Luiten, 2001; Farkas et al., 2004b; Liu et al., 2005) and the neuropathologic changes (Kreutzberg, 1996; Farkas et al., 2004b; Panickar and Norenberg, 2005; Ohtaki et al., 2006; Eisel et al., 2006). Additionally, this model has been used to study cerebrovascular WM lesions (Wakita et al., 2002; Takizawa et al., 2003; Farkas et al., 2004a). In the traditional 2-VO experiment, silk suture is used to ligate the bilateral common carotid artery, and an acute phase after the occlusion with dramatic CBF fall ensues. To improve the 2-VO model, researchers have tested some alternative methods. For example, a silicone collar cuff can be placed around the common carotid artery in order to reproduce the inflammatory response caused by atherosclerosis. However, this operation does not cause long-term memory impairment (de Bortoli et al., 2005). A study in which the two common carotid arteries were occluded at intervals of 1 week found that procedure leads to a progressive decrease in brain perfusion, and decreased mortality compared to procedures that occlude both arteries at once (Sarti et al., 2002a and 2002b). But an undesirable feature of these protocols is that the rats must undergo anesthesia twice a week, which can be stressful to the animal. Kitaguchia et al. (2009) use a 30 min delay between carotid arteries in the murine BCAS model to decrease mortality. Other research groups use ameroid constrictors in place of the silk suture. The ameroid constrictors consist of a titanium shell surrounding the hygroscopic casein material with the internal lumen. The casein component gradually absorbs water and thus expands, resulting in narrowing and occlusion of its encased arterial lumen. So the reduction of the CBF could be mild without a sharp drop (Hattori et al., 2015). Here, we described a protocol in detail for performing 2-VO in rat. Figure 1. Schematic diagram of the circle of Willis in human (A) and rat (B). 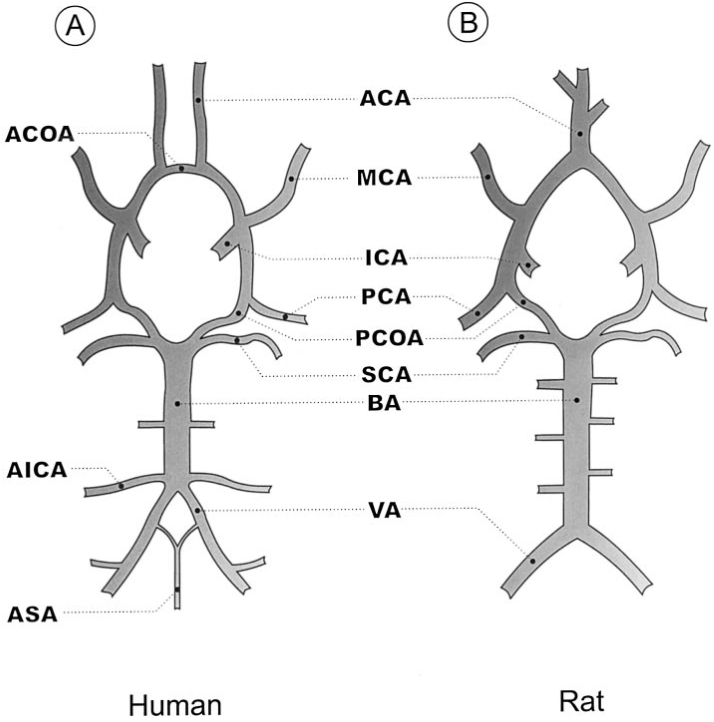 ACA (anterior cerebral artery); ACOA (anterior communicating artery); AICA (anterior inferior cerebellar artery); ASA (anterior spinal artery); BA (basilar artery); ICA (internal carotid artery); MCA (middle cerebral artery); PCA (posterior cerebral artery); PCOA (posterior communicating artery); SCA (superior cerebellar artery); VA (vertebral artery). This figure is adapted from Eszter Farkas et al. (2001). Figure 2. Surgery tools. 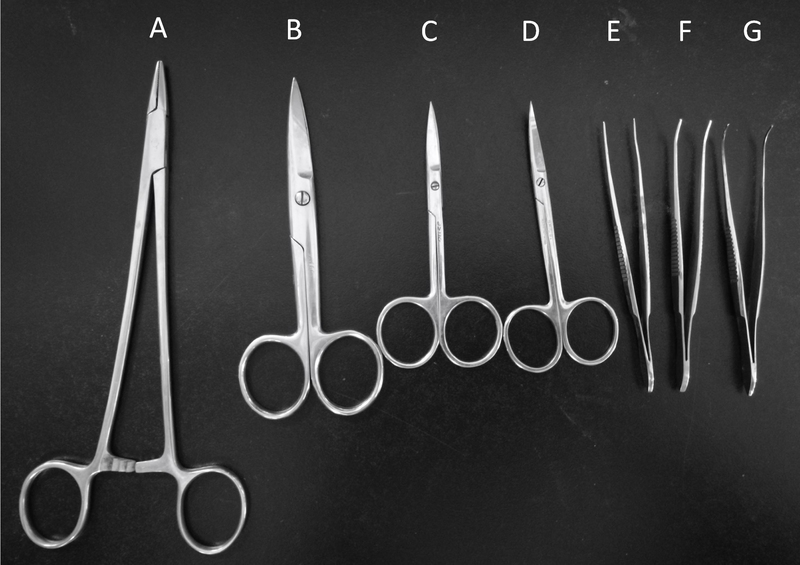 Needle holder (A), Operating scissors (B), Straight ophthalmic scissors (C), Curved ophthalmic scissors (D), Hemostatic forceps (E), Ophthalmic forceps (F), Tissue holding forceps (G). Ethical statement: Adult male Sprague-Dawley (SD)/Wistar rats (10-12 weeks) were used in this protocol. All procedures involving animals follow the local animal ethics protocols and standards. Fast the rats for 12 h before the experiment. Anesthetize rats with chloral hydrate (300 mg/kg) by intraperitoneal injection using a 2 ml syringe with a needle. Note: Slightly press the paw of the rat, it indicates the rat is in deep anesthesia if there are no reflex actions of hind limb. Fix the rat on its back on a dissection board. 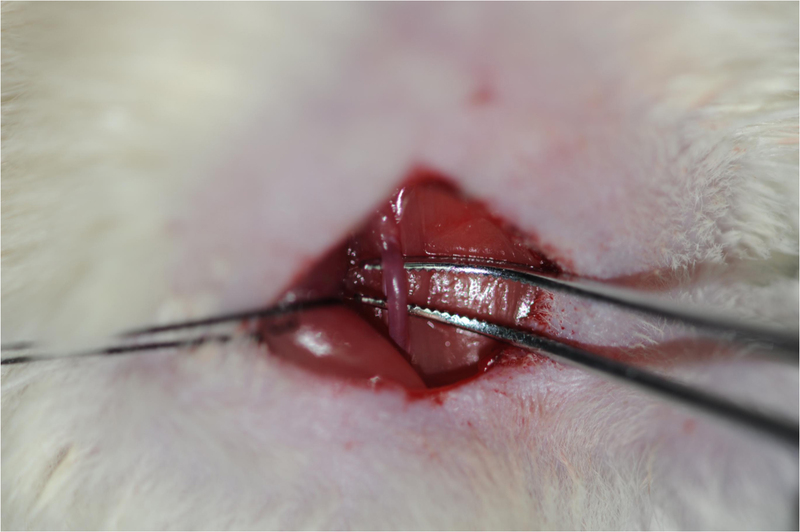 Shave the fur of the ventral neck using curved ophthalmic scissors. 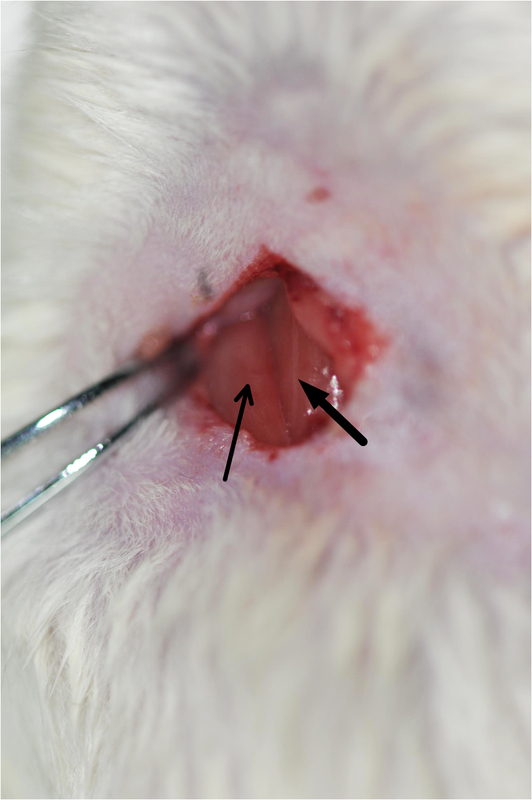 Sterilize the shaved skin first with iodine tincture and then with 75% ethanol using cotton swabs (repeat three times) (Figure 3). Note: In order to minimize the risk of infections, thoroughly sterilize the dissection board with 75% alcohol before the surgery. Use operating scissors to make a midventral cervical incision in the middle of the neck in the upper edge of the sternum (about 1-1.5 cm long). Gently remove the submandibular gland using the ophthalmic forceps. This will expose the sternocleidomastoid muscle and sternohyoid muscle (Figure 4). Figure 4. Image of the exposed sternocleidomastoid muscle (indicated by the thin arrow) and sternohyoid muscle (indicated by the thick arrow). Cut the skin, remove the tissues, and expose the sternocleidomastoid muscle and sternohyoid muscle. Carefully separate the common carotid arteries from the adhering tissues using ophthalmic forceps. Be careful and avoid causing any damage to the vagus nerve (Figures 5 and 6, Video 1). Note: Gently pull apart the sternocleidomastoid muscle deep in the sternohyoid muscle (until the sternohyoid muscle appears), there will be the common carotid arteria wrapped by fibrous connective tissue, which contains the vagus nerve in its sheath and pulses regularly. Figure 6. 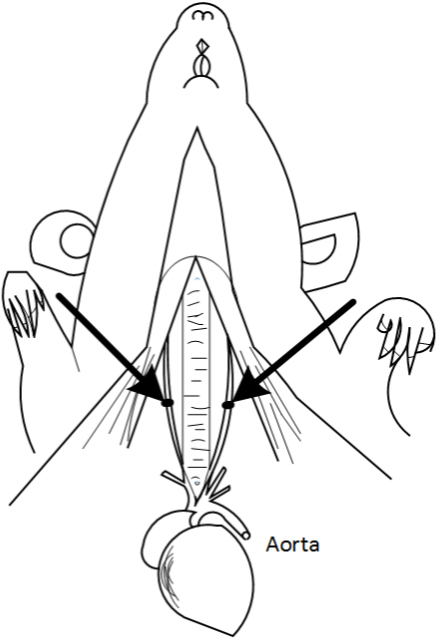 Schematic diagram of the Bilateral carotid artery. The arrows indicate the common carotid artery. This figure is adapted from Eszter Farkas et al. (2001). The bilateral common carotid arteries are doubly ligated with 4-0 silk suture, the two sutures are next to each other, then the surgical wounds are sutured back with silk suture. 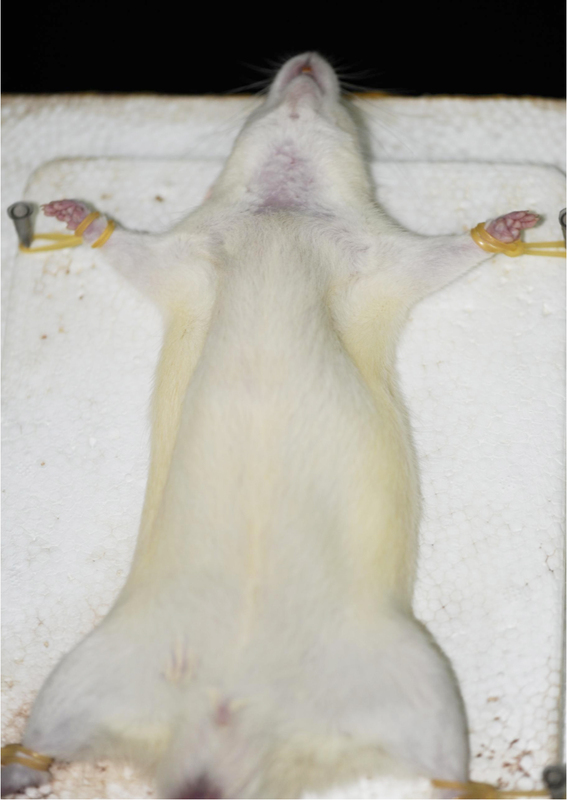 Return the rat back to its cage until it fully recovers from anesthesia (Figure 7, Video 2). The silk suture won’t be absorbed over time. They remain in place until it is executed. After surgery, feed the rat with an appropriate amount of penicillin to prevent infection. The rat is kept warm on the heating pad (37.0 ± 0.5 °C) throughout the surgery until the rat is completely awake. Figure 7. The common carotid artery ligation and wound closure. The blue arrow indicates the common carotid artery; the black arrow indicates the vagus nerve. Cerebral blood flow was tested by ASL in our experiment. Cerebral Blood flow reduced a lot 2-3 days after the 2-VO surgery, reaching 30%-45% of the control level. Two weeks after the surgery, the CBF recovers to 55-65% of the control, and it can reach up to 70%-80% of the control level four weeks after 2-VO surgery. All instruments directly in contact with the wound must be sterilized using the dry sterilizer. Keep the rat warm after surgery. Do not damage the trachea and vagus nerve during surgery. The trachea is just below the sternal hyoid muscle, and the vagus nerve is accompanied with the common carotid artery in the carotid sheath. Make sure that the anesthesia is successful because repeated anesthesia can lead to increased rat mortality. Carry out the operation as quickly as possible. It is better to finish the whole procedure in 15-20 min (not more than 30 min at most). The rat will wake up about half an hour after surgery. Drooping eyelid and small fission indicate a successful operation. After the rate is fully awake, it is fed a normal diet. This work was supported by National Natural Science Foundation of China (No. 81271310) and Key project of science and technology program of Beijing Municipal Education Commission (No. KZ201610025021). This protocol was adapted from Farkas et al. (2007). The author(s) declared no potential conflicts of interest with respect to the research, authorship, or publication of this article. Choy, M., Ganesan, V., Thomas, D. L., Thornton, J. S., Proctor, E., King, M. D., van der Weerd, L., Gadian, D. G. and Lythgoe, M. F. (2006). The chronic vascular and haemodynamic response after permanent bilateral common carotid occlusion in newborn and adult rats. J Cereb Blood Flow Metab 26: 1066-1075. De Bortoli, V. C., Tangrossi Junior, H., de Aguiar Correa, F. M., Almeida Sde, S. and de Oliveira, A. M. (2005). Inhibitory avoidance memory retention in the elevated T-maze is impaired after perivascular manipulation of the common carotid arteries. Life Sci 76: 2103-2114. De la Torre, J. C. (2002). Vascular basis of Alzheimer's pathogenesis. Ann N Y Acad Sci 977: 196-215. Eisel, U. L., Biber, K., Luiten, P. G. M. (2006). Life and death of nerve cells: therapeutic cytokine signaling pathways. Curr Signal Transduct Ther 1: 133-146. Farkas, E., Donka, G., de Vos, R. A., Mihaly, A., Bari, F. and Luiten, P. G. (2004a). Experimental cerebral hypoperfusion induces white matter injury and microglial activation in the rat brain. Acta Neuropathol 108(1): 57-64. Farkas, E., Institoris, A., Domoki, F., Mihaly, A., Luiten, P. G. and Bari, F. (2004b). Diazoxide and dimethyl sulphoxide prevent cerebral hypoperfusion-related learning dysfunction and brain damage after carotid artery occlusion. Brain Res 1008(2): 252-260. Farkas, E. and Luiten, P. G. (2001). Cerebral microvascular pathology in aging and Alzheimer's disease. Prog Neurobiol 64(6): 575-611. Farkas, E., Luiten, P. G. and Bari, F. (2007). Permanent, bilateral common carotid artery occlusion in the rat: a model for chronic cerebral hypoperfusion-related neurodegenerative diseases. Brain Res Rev 54(1): 162-180. Hattori, Y., Enmi, J., Kitamura, A., Yamamoto, Y., Saito, S., Takahashi, Y., Iguchi, S., Tsuji, M., Yamahara, K., Nagatsuka, K., Iida, H. and Ihara, M. (2015). A novel mouse model of subcortical infarcts with dementia. J Neurosci 35(9): 3915-3928. Kitaguchi, H., Tomimoto, H., Ihara, M., Shibata, M., Uemura, K., Kalaria, R. N., Kihara, T., Asada-Utsugi, M., Kinoshita, A. and Takahashi, R. (2009). Chronic cerebral hypoperfusion accelerates amyloid beta deposition in APPSwInd transgenic mice. Brain Res 1294: 202-210. Liu, H. X., Zhang, J. J., Zheng, P. and Zhang, Y. (2005). Altered expression of MAP-2, GAP-43, and synaptophysin in the hippocampus of rats with chronic cerebral hypoperfusion correlates with cognitive impairment. Brain Res Mol Brain Res 139(1): 169-177. Matsuda, H. (2001). 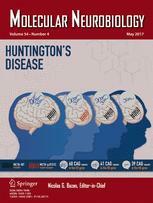 Cerebral blood flow and metabolic abnormalities in Alzheimer’s disease. Ann Nucl Med 15: 85-92. Ohta, H., Nishikawa, H., Kimura, H., Anayama, H. and Miyamoto, M. (1997). Chronic cerebral hypoperfusion by permanent internal carotid ligation produces learning impairment without brain damage in rats. Neuroscience 79(4): 1039-1050. Ohtaki, H., Fujimoto, T., Sato, T., Kishimoto, K., Fujimoto, M., Moriya, M. and Shioda, S. (2006). Progressive expression of vascular endothelial growth factor (VEGF) and angiogenesis after chronic ischemic hypoperfusion in rat. Acta Neurochir Suppl 96: 283-287. Otori, T., Katsumata, T., Muramatsu, H., Kashiwagi, F., Katayama, Y., Terashi, A. (2003). Long-term measurements of cerebral blood flow and metabolism in a rat chronic hypoperfusion model. Clin Exp Pharmacol Physiol 30: 266-272. Panickar, K. S. and Norenberg, M. D. (2005). Astrocytes in cerebral ischemic injury: morphological and general considerations. Glia 50(4): 287-298. Sarti, C., Pantoni, L., Bartolini, L. and Inzitari, D. (2002a). Persistent impairment of gait performances and working memory after bilateral common carotid artery occlusion in the adult Wistar rat. Behav Brain Res 136(1): 13-20. Sarti, C., Pantoni, L., Bartolini, L. and Inzitari, D. (2002b). Cognitive impairment and chronic cerebral hypoperfusion: what can be learned from experimental models. J Neurol Sci 203-204: 263-266. Schmidt-Kastner, R., Truettner, J., Lin, B., Zhao, W., Saul, I., Busto, R. and Ginsberg, M. D. (2001). Transient changes of brain-derived neurotrophic factor (BDNF) mRNA expression in hippocampus during moderate ischemia induced by chronic bilateral common carotid artery occlusions in the rat. Brain Res Mol Brain Res 92(1-2): 157-166. Takizawa, S., Fukuyama, N., Hirabayashi, H., Kohara, S., Kazahari, S., Shinohara, Y. and Nakazawa, H. (2003). Quercetin, a natural flavonoid, attenuates vacuolar formation in the optic tract in rat chronic cerebral hypoperfusion model. Brain Res 980(1): 156-160. Tomimoto, H., Ihara, M., Wakita, H., Ohtani, R., Lin, J. X., Akiguchi, I., Kinoshita, M. and Shibasaki, H. (2003). Chronic cerebral hypoperfusion induces white matter lesions and loss of oligodendroglia with DNA fragmentation in the rat. Acta Neuropathol 106(6): 527-534. Wakita, H., Tomimoto, H., Akiguchi, I., Matsuo, A., Lin, J. X., Ihara, M. and McGeer, P. L. (2002). Axonal damage and demyelination in the white matter after chronic cerebral hypoperfusion in the rat. Brain Res 924(1): 63-70. How to cite: Cao, D., Bai, Y. and Li, L. (2018). Common Carotid Arteries Occlusion Surgery in Adult Rats as a Model of Chronic Cerebral Hypoperfusion. Bio-protocol 8(2): e2704. DOI: 10.21769/BioProtoc.2704.